Here are my current favorite math materials for my 4 (in 7 days) year old. These are the most versatile math manipulative I have ever encountered. They quickly replaced the number rods and the Montessori 1-10 beads for counting lessons and J-jo quickly learned what number is represented by each color. Bear uses these for division and more complex multiplication. They are similar enough to the Montessori bead materials to appease to my Montessori want-to-be side, yet are more versatile as they can be used to teach more math concepts. They are also fun for building. We often use them in conjunction with my favorite math material number 2. This is my favorite website to visit, replete with videos on numerous math topics ranging from preK to grade 4-ish in which Rosie and her children do lessons using the cuisenaire rods. You absolutely must visit this website. J-jo and I use many of her games and lesson ideas. It’s great to practice counting to one hundred and to learn to recognize patterns in numbers. 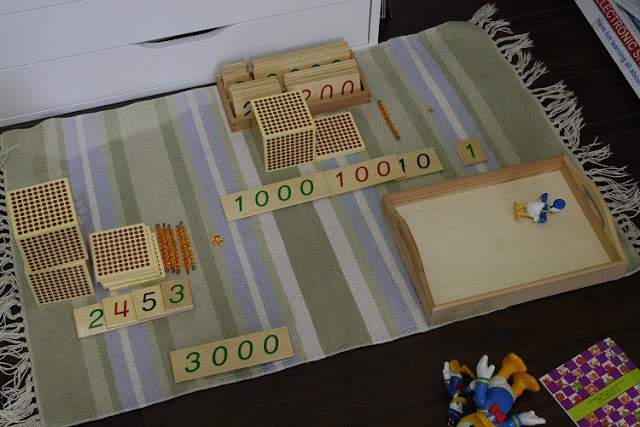 We also use a poster version from the Dollar Tree for quick counting, but what I like about the hundred board is that I can set up hundred board puzzles (as shown in photo) for the kids to solve. The one in the photo is from Kid Advance. This material is great for J-jo to learn the base ten system visually. There’s some great Montessori lessons using the golden beads. Some can be found here. I like the bead layout, which is a very large, impressive work for a young child. J-jo and I like to play the “bank game,” in which I give him a number card and he goes to the bank to get the corresponding golden bead material. In this way he learns about building numbers and that the value of the digits can change (as you can see in the photo with 2453). I don’t have a photo of this in use, but I like the Rightstart method of teaching that numbers from 6 to 10 can be seen as 5+a number. 5 and 2 are 7, 5 and 3 are 8 and so on. 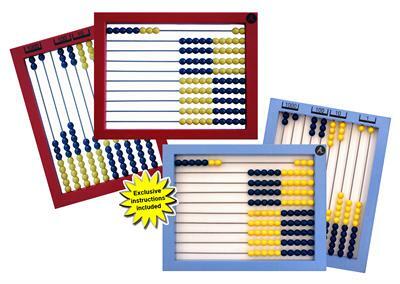 The abacus is a great tool for this and the Rightstart abacus is special because each five beads is one color so the child can easily see the 5 and 2, for example. This is great. I need to think about my own post on this topic 🙂 You have beautiful materials. Just out of curiosity what book is in the picture with the cuisinaire rods. It looks fun! The book is the Miquon orange book. You can buy the Miquon books from Christian Book Distributor or Rainbow Resources and Curclick sells a black and white PDF downloadable version. I agree with you that those are good and beautiful materials. Where did you get the Golden Bead Materials (and how much are they)? They were mostly from Kid Advance and some (I think the golden ten bars) were from another supplier but I won't say since I don't recommend them at all. I always get good customer service from Kid Advance and their prices are reasonable. The quality is fine for me, though some prefer the higher end materials. Love your Cuisenaire Rods! Are they made of wood? Where can I get them? I can see some at Learning Resources but can't decide what to get. Other varieties include connecting rods. @Jae – I recommend the wood as you can stack them into walls of whatever number bond you are working on. Ours are plastic, but I do have a very small, small set of wooden ones and we actually prefer them, but I refuse to shell out more money, so for us, plastic will have to do! I do not recommend the connecting rods if you are planning to use education unboxed activities to go with them. The idea behind the true cuisenaire rods is to learn to associate a color with a value and the notched quality of the connecting rods deters from that. The beauty of the cuisenaire rods is that you can use any rod to represent the number one once you are working with fractions. Hi! Thank you so much for your response. It helped a lot in planning what to buy as you know it's not easy to spend too much on something these days especially if it's not worthit. Speaking of which, I am purchasing my first ever montessori materials, can you make a post on the"must haves"? My son is 5 and a new one is coming so I was thinking that it's worthit anyway. I plan to get decanomial beads, knobless cylinders, questions and sums box (difference as well) and moveable letters (2 sets). Would you recommend them? How about puzzle maps? Thank you! I love the Hundred Board. I still have our first laminated 100’s chart. I think I am in love with that Hundred Board! I want one. I’m going to have to look into that for Supergirl. Thanks for linking up to my Favorite Anything link up.